Argentina Cruises Are Very Popular - But Are They Safe? Argentina Cruises Are Very Popular – But Are They Safe? In recent years, some regions of South America have grown to have a negative reputation for crimes against tourists. Argentina has worked diligently to reverse that negative aspect and is welcoming tourist with open arms to come experience the warm culture that is, viva Argentina. Wondering whether Argentina cruises are safe? Read on where we provide more info on the subject. The U.S. State Department currently has no adverse travel warnings published regarding travel to or within Argentina or their open waters. Cruising through this South American region is expected to be smooth sailing. If making any pre or post cruise arrangements to visit cities in Argentina, it is wise to use common sense precautions to avoid street crime. A healthy sense of situational awareness is vital whenever traveling abroad. Additionally, checking safety tips and registering your travel plans with the U.S. State Department arms you with valuable information while on vacation. Tap water is safe to drink in all major cities. While no immunizations are required, the health conscious traveler should consult with a doctor or the Center for Disease Control regarding Hepatitis A and B vaccines, as well as Typhoid recommendations. South American countries have experienced outbreaks of Dengue Fever in the past, so tourists should make preparations to avoid mosquito bites as much as possible. Now that safety concerns have been addressed, your attention should be focused on what is making cruising adventures so popular. For starters, it is quickly becoming an eco-tourist destination of choice. Perfect for solo travelers, as well as couples and families can enjoy an Argentina cruise itinerary. These itineraries are fit for the adventure minded cruisers, as many of them are best described as Land Rover meets the sea. Meaning that there is more functionality and hands on involved and less luxury and pampering. For many of the Argentina cruises, small ship vessels are used to navigate these waters and they are capable of reaching the most remote corners with easy and agility. An Australis cruise itinerary may include an Amazon adventure expedition, where you will be on the lookout for elephant seals and other indigenous wildlife. But you won’t return without a brief visit through Glacier Alley. A Patagonia cruise will invite you to incredible fjord expeditions, where you can witness the natural phenomena produced by melting glaciers for yourself. The most common reasons given by other cruisers for selecting this trip, is to navigate through the channels. In a class all by its self, would be the Ushuaia cruises. 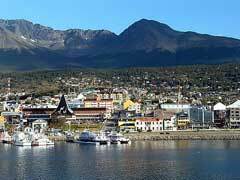 Taking a cruise to South America and being so close to the southernmost city in the world, Tierra del Fuego is an interesting conversation topic that will be an enjoyable memory for years to come. So what are you waiting for? Come aboard and welcome to your Argentina cruise.